Tjukurrpa refers to origins and powers embodied in country, places, objects, songs and stories. It is a way of seeing and understanding the world and connects people to country and to each other through shared social and knowledge networks. It is both past and present, similar to ‘The Dreaming’. In the last 2 years alone, Tommy Watson, Warlimpirrnga Tjapaltjarri & Yukultji Napangati have all had works exhibited in New York and Miami. Warlimpirrnga & Yukultji recently featured at Art Basel 2017 in Switzerland and Art Basel Miami 2017. 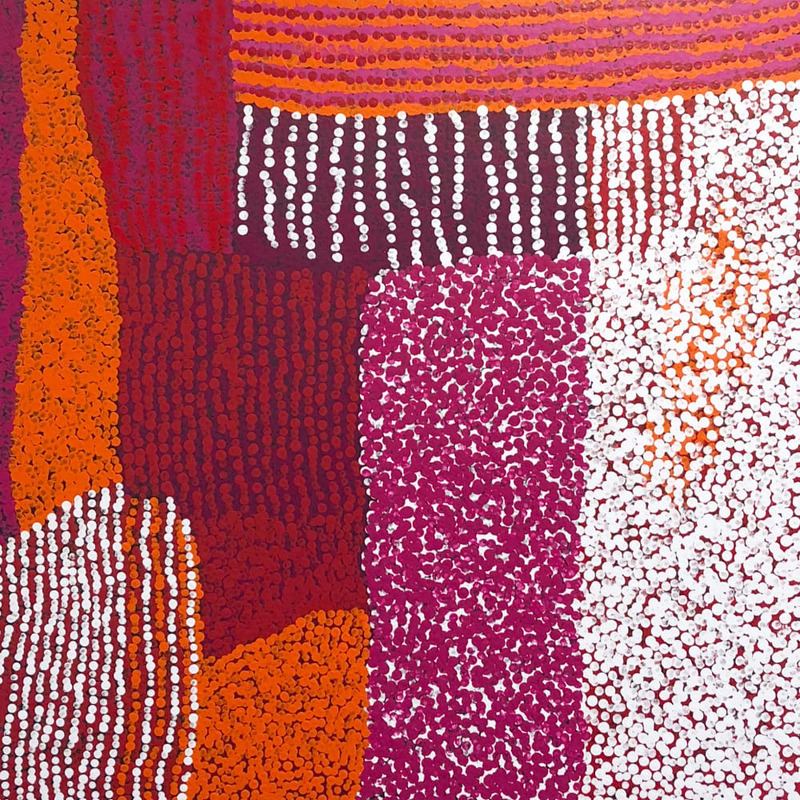 Warlimpirrnga’s work set a new auction record for a single work by a living Indigenous artist at Sotheby’s in London in 2016, achieving GBP167,000 (AU$285,000) for a 183 x 244cm painting, surpassing Tommy’s record mark of $240,000. This was followed by further strong results at Sotheby’s London this year, with the largest Warlimpirrnga achieving GBP93,750 (AUD$166,000). George ‘Hairbrush’ Tjungurrayi is currently featured in the 2018 Biennale of Sydney, following his inclusion in the Wynne Prize for landscape painting over 3 consecutive years 2014-16, receiving a ‘Highly Commended’ award last year. Charlie Tjapangati commenced painting in 1978, after having observed the older men painting while living in West Camp, Papunya. Stories from the Tingari cycle were the usual subject of his paintings, including the monumental canvas now in the collection of the National Museum of Australia, which was shown in Australian Perspecta 81 at the Art Gallery of NSW, one of the first institutional acts of acknowledgement of Papunya paintings by the Australian contemporary art world. It is an important moment in time as these artists are increasingly collected in the international market and setting new record prices. Collectors realise the opportunity to acquire great works in the primary market is fast declining.